Raclette cheese has given its name to one of the most traditional of Swiss meals, simply called “raclette,” which originated with Alpine dairy farmers in the southern Swiss canton of Valais. They would place the cut side of a half-wheel of cheese in front of a fire, and when the cheese bubbled and melted, they would scrape it off onto a plate (racler means “scrape” in French) and eat it with boiled potatoes and pickled vegetables. Melting devices that hold an entire half wheel of cheese (about 6 pounds) mimic this original custom. 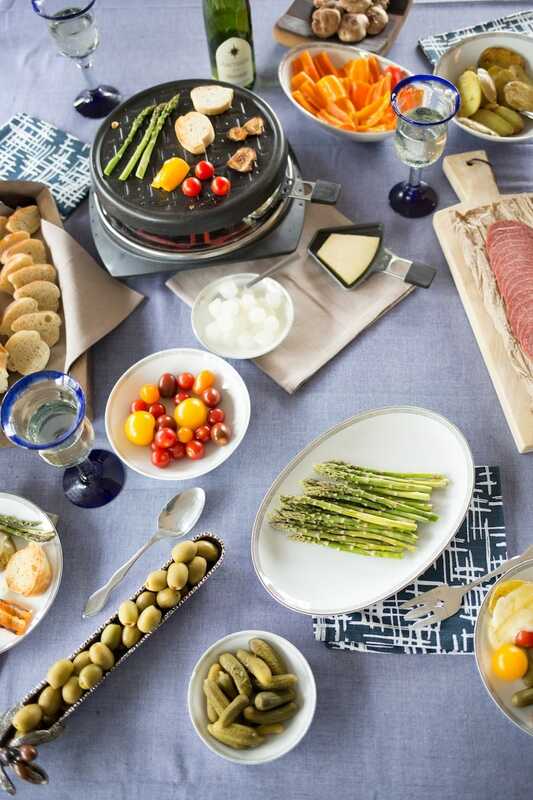 But the more common way to prepare raclette at home is with a special tabletop grill that allows each person to melt his or her own cheese in little trays that slide under a heating element. Figure about 1/3 to 1/2 pound of cheese per person, and cut it into 1/4-inch thick slices of a shape and size to fit nicely into the trays. Boiled small waxy potatoes (three to four per person), cornichons and pickled onions are still de rigueur for an authentic raclette dinner in Switzerland, as are a sprinkling of pepper and paprika on the melted cheese (which should be just bubbly, not separating). Here in America, however, this simple meal often turns into an elaborate feast when hosts add a wide array of accompaniments to the mix that might include a selection of cured and dried meats (e.g. salami, prosciutto, bresaola), cooked sausages, and/or various vegetables (e.g., asparagus, mushrooms, Brussels sprouts, cherry tomatoes, sweet onion, bell peppers). The stone or cast-iron top of a raclette grill is ideal for cooking the sausage and vegetables. Crisp white wine is the preferred pairing for raclette, but a lightly acidic red—or even cider, hot tea or beer—also does the trick. And most Swiss believe that a shot of Kirsch after dinner is good for digestion! The Love Story Behind Leelanau Cheese + Raclette Recipes!